The Great American Solar Eclipse Souvenir Pressed Penny is the perfect souvenir for the spectacular solar eclipse coming August 21st, 2017! Grab a penny to remember the amazing day! I got one for my 4 year old Nephew as I'm starting him on his squished penny addiction and he loves it!! The design is really clean and easy to see & the penny is super sturdy, so his 4yr old little fingers can't bend it. Really glad I got one for myself too! I just recently bought the Solar Eclipse penny. I am very happy with how fast it came in and how great it looks. 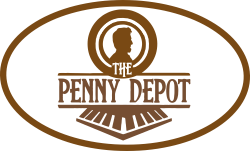 The penny is really neat and a great memento. This penny is great, I am so glad I ordered one. This way I can always remember the great solar eclipse of 2017. I love the way it turned out and plus I love that I was able to get a hole punched in it. The smashed penny is awesome. I love the eclipse!! My son collects squished pennies and he was more than thrilled to receive this gift! With the image being as small as it is to encompass a whole lot, I didn't really think it would look as perfect as the picture. However, it does. There is excellent detail to be able to ascertain all of the images!! Ordering was quick and painless. Ordered on monday after the eclipse and it waiting on me when i returned from home from vacation 3 days later. My pennies were better than expected and came in a very timely manner. I have recommended this company to several people and would definitely order from them again!